We both needed a good night's sleep and that sure happened. I noticed there was some light outside the thick drawn curtains, and when I heard Steph stir, I asked what time it was. "11:00!" What!? We missed breakfast downstairs, had to postpone our 2 PM shopping trip pickup by Shah and our driver till 4 PM. We had to leave the room so the ladies could straighten it up, so we had lunch downstairs - a yummy Thai soup while we worked away on our computers. Biggest mission today: shopping! Going to a birthday party for a sultan, at which the King of Malaysia and a couple of Gulf State princes will be in attendance apparently calls for more dressy clothing than my riding tights or the Goodwill hand-me-downs I live in. Steph needed shoes and a scarf or shawl for her dress; she said we needed to find me a dress. I said I don't do dresses. She said we could find me some pantaloons. I said a dress would be just fine. We also needed to find a trophy shop for an engraved plate to put on the Painted Pony gift Steph got for the sultan. 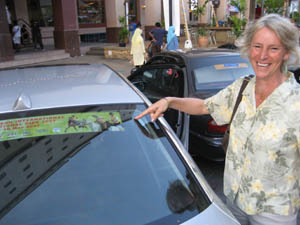 It's a beautiful blue pony with snowflakes on it - I wonder if most people here in Malaysia have ever seen snowflakes? Shah and Mr Mahadi picked us up at 4 PM in the tropical heat, and drove us first to a trophy shop. Mr Mahadi and the nice girl who waited on us helped advise Steph what would be tasteful for the sultan and what type of engraving to use. From there Shah and Mr Mahadi escorted us to a big shopping mall. Four stories tall, full of local people - again, we were the only gringos around. Steph found a lovely scarf in the first shop we walked in, and the next shop we visited was for me. Most of the women around here wear very colorful clothing with head scarves. What on earth would I look good in? The other problem was finding something that fit! I'm a pretty thin-sized female in the US, but here I'm taller and wider than most women (Steph towers over everybody), and I don't fit in their small sizes! The girls waiting on me were laughing every time I said I needed a bigger size. I found one shirt I liked, ("I need it bigger!") but that really wasn't dressy enough for kings and sultans and princes. We picked out a nice black blouse, and to go with it I tried on a few skirts, and hooray, a pair of black pants that looked nice enough to get away with. Mr Mahadi suggested we look next door at some silk batik clothing; we had a look, and wow, what eye-catching dazzling stuff! I didn't even know where to start, told the girl I was looking for evening wear. She said "You are S, no?" Recalling all those tight tight shirts in the previous store I couldn't get in, (my head almost got stuck in one) I said "No, I don't think I'm small. Medium, maybe." She immediately zeroed in on this spectacular vivid red long blouse and skirt on the dummy in the window. Yikes! I took it in the dressing room and tried to slither into it but it was way too small. I could barely button the blouse, and the skirt, well, I couldn't get the zipper halfway up. But, it was pretty amazing, so I stepped out to show it off. I got some Wows, and the girl came up to turn the skirt around - I had the slit in back instead of on the side. I'd realized my mistake but since it was way too small hadn't bothered to adjust. She and I both tried to tug it around into the correct position, but it was way too small and I was clammy from the heat, so we had a good laugh until we just gave up. "You need medium!" she said. and as In the dressing room I peeled off the bright red one, and she handed me through the door a medium outfit - in bright pink! Whoa! Though I'm NOT a bright pink person, and these outfits were way too expensive for me anyway, everyone, including some other Malay shoppers, seemed to be having a good time watching the gringo try on the beautiful Malay outfits, so I put it on. Quite dazzling! But not quite me! We went back to the other shop and I picked up the pieces I'd already tried on. The girl there delightedly gave me a 10% discount on every item, AND she gave me a VIP shopping card, for the next time I come back to Malaysia and shop there! Next on the list were shoes. Steph needed a few pairs, and I guess if I was going to look good up top, I guess I shouldn't wear my riding boots or my tevas around sultans and kings and princes. Shoe shopping required another mall, at which we both found pairs. Mr Mahadi and Shah acted patient and indulgent, but I expect they were quite happy when we told them we were ready to leave. We walked out to the car in front of the City Plaza shopping center, and suddenly Steph says, "Hey! Look!!" She ran to a banner hanging off a lamp post - with her picture on it! 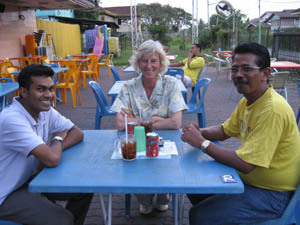 It's a picture of her and 2 other endurance riders in last year's Terennganu ride, and is the same picture/poster that is on the cover of the Kedah Invitational ride packet given to us (and will be distributed to everyone involved in the ride.) 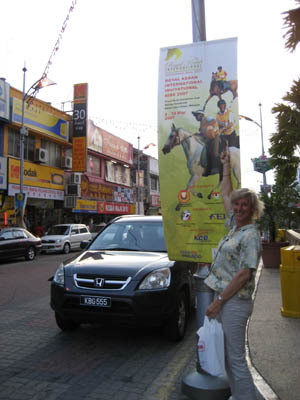 Steph, famous, plastered on the cover of a booklet and on posters, hanging in the streets of Alor Star, Kedah, Malaysia! I'm hanging out with a celebrity! And then from there, things went out of control. "Oh my god! Look!!" 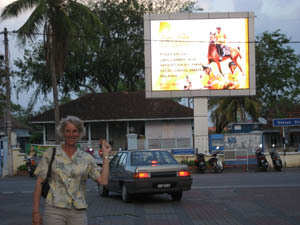 Down the street the other way, there was the same picture - Steph - flashing on a big billboard!! I took a picture, we had a laugh and we walked back to the car - and there Steph was AGAIN! Big bumpersticker of her on the back window of the car! On the way home we stopped at an Indian restaurant where we pigged out on some delicious curries and rice and nan bread. Steph and I didn't know what to order - it all looked fantastic, so Mr Mahadi filled our table. The air was actually not so terribly hot because a nice breeze was blowing, and as the sun set, the trees lining the street were invaded by a billion noisy starling-like birds, and then the call to prayer filled the air. 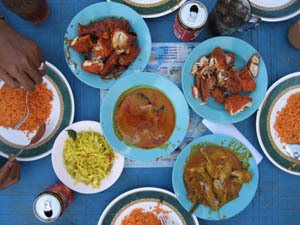 What better place to be is there other than hanging out, shopping and eating Indian food with a celebrity in Malaysia!